Robert Bresson makes his directorial strategies blatant from the opening frames of this quiet, bleak, masterful movie. Two armored knights, effectively burdened by their own bodies, slowly lift arms and swords and attack each other. One dies, but who is he? We&#146;re not told. Another knight (or is it the victorious one?) rides through a forest. We see only metal legs and a horse&#146;s body as it passes through the frame; the camera does not care to follow this man, whoever he is, on his journey. More anonymous bodies are shown, lying dead and burning beside a thatched house. Another knight rides past, without stopping or seeming to register these corpses. Lancelot Of The Lake is a relentless, implacable demythologization of the story of King Arthur and the Knights of the Round Table. Camelot is no glorious castle; it&#146;s just some wooden fortifications and tents. The knights themselves are grim figures, haunted by the recently abandoned, failed quest for the Holy Grail. At one point, Arthur leads Lancelot and Gawain into the fort&#146;s central chamber and gestures around the table, ticking off all the seats that are empty, naming all the knights who have died in service of a goal Bresson quite clearly sees as foolish and futile. He doesn&#146;t have much more sympathy for the consuming passion at the center of the tale – the affair between Lancelot and Queen Guinevere. Bresson stages the lovers&#146; meetings as glum, deadpan exchanges of expository dialogue. They stand on opposite sides of the room from each other, throwing words into the space between them like bricks onto a pile. 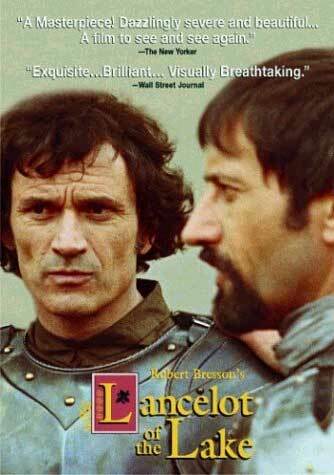 It is not enough that Lancelot&#146;s fellow knights have died for nothing; to Bresson, even his protagonist&#146;s love must be devalued, neutered, debunked. A bagpiper (whose face is not shown) blows the fanfare to signal the beginning of the contest. A horse rides past the camera, with only its rider&#146;s legs visible. There is a crashing sound. One knight falls off his horse – we&#146;re permitted this minimal catharsis. What&#146;s amazing about this movie is that it&#146;s never boring. Bresson strips away frippery to such an extent that it should be a coma-inducing slog, but it&#146;s not. The formal constraints serve, somewhat perversely, to heighten the drama. If all this is so pointless, we&#146;re left wondering, why did he bother making the movie? Clearly, he still sees something heroic in these people. Perhaps the very futility of their quest, their jousts, their passions, is what fascinates Bresson. Lancelot Of The Lake may be the direct opposite of John Boorman&#146;s campy, melodramatic Excalibur, but it&#146;s just as involving a take on the Arthurian myth as that film.